Even if your visual data presentation looks awesome, that doesn’t mean the message is getting across. One reason this happens is that sometimes the numbers don’t mean anything to the audience; they don’t have the number in a context they can relate to. This is one of the powers of map-based presentations: viewers can often place themselves in the map say things like “let me compare my town to the next one over”. That offers a relevant context for the information. So how do you do this with raw numbers? Recently, I attended the OpenVis Conf event here in Boston. It was a fantastically nerdy collection of smart folks talking about visualization. One of the speakers was Amanda Cox, from the New York Times. One of the ideas she touched on was the concept of the “Kooky Comparison” (check out the video of her talk if you have an hour to spare). She particularly likes graphics that include this comparison of a piece of information to something else in a silly or surprising way. 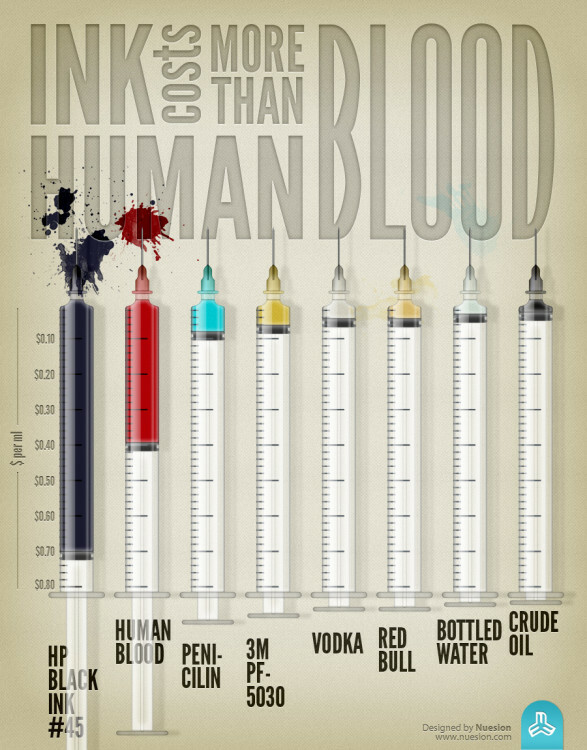 For instance, comparing the cost of printer ink to the cost of blood! I loved Amanda’s reminder. Turns out, non-profit speak has a name for this! The Institute for Sustainable Communities at Berkeley called this technique social math. Cute name! Like my map example from earlier, the idea is to offer the audience a relevant context for the information (read some more on ImpactMax or SightlineDaily). Previous Previous post: Going to Data Camp!